What does this mean? Basically they will allow anyone to set up and publish content on the website based around what they are calling information “hubs”. There will be “destination hubs” and “interest hubs” (e.g walking and hiking). They plan to moderate all content added to approve it being published (to check it is appropriate) but don’t intend on actively changing content. If you publish content then you are the owner of that page (forever) and can edit or add to it anytime. This is quite a bold strategy, one that will no doubt have a lot of RTO’s, iSITEs, travel sellers and tourism operators in a mad rush to create and own content for their key destinations and areas of interest. They seem to be fairly open to the fact that some may misuse this for their own benefit but will no doubt watch on carefully with interest on how it will evolve. 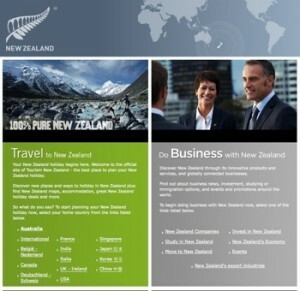 The key strategy with this is to structure the site around topics of interest that will help sell New Zealand to travellers with content that shows rich New Zealand experiences and their vision is to create a “market place” to connect travellers with tourism experiences and products (although they aren’t going as far as providing a booking system). Currently they have some hubs set up in a pilot test site and it sounds like they will roll this out on the live site within 6-8 weeks. So keep an eye out for it! What do you think about this concept? In theory, it sounds like a great idea to me. The NZ tourism sector is essentially one big collective and this enables a larger set of minds to think of ways to promote the goodness of Aotearoa. Social media provides the tools. All we need now are fresh ideas and kiwi ingenuity. Hi Cymen, yes I agree, I think it sounds like great idea and I’m particularly looking forward to content from travellers because I think this is likely to be the most powerful aspect of the open content strategy for newzealand.com. Also a good opportunity for the NZ tourism community to provide more meaningful content on it too. I think it’s an exciting if not risky move. This is sure to challenge the many SMEs (majority of the industry) that still struggle with e-marketing.